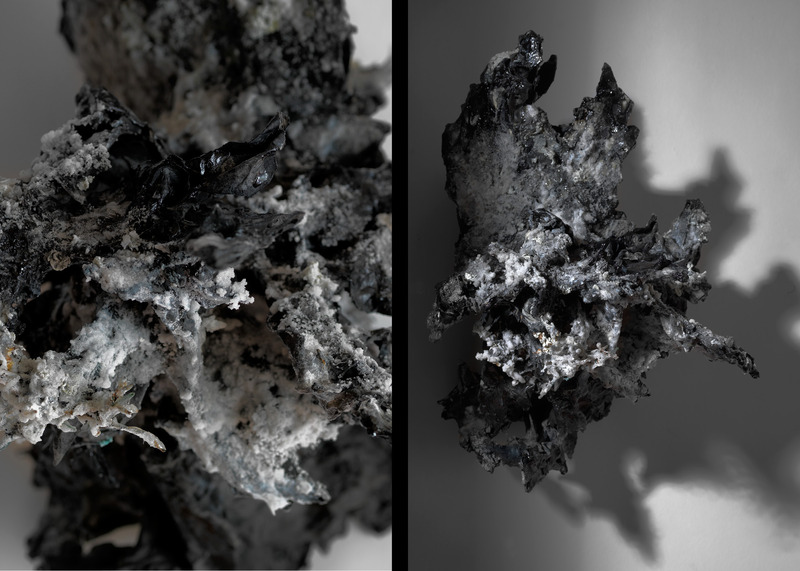 All of my work is rooted in drawing which I define, following anthropologist Tim Ingold, “an indelible record of the pressure of the fingers on the pencil that makes it, driven by impatience, control, or anxiety of the maker… an archive of the maker’s muscle.” I cull from a faded memory bank of images, root systems, lava flows -archetypal systems of growth, flow and movement- that I wrestle into an abstracted, affective experiential state. My tool for my drawing has been tape which I tear and layer into a physical presence to increase tactility of the surface and contour which I also feel heightens its raw materiality. My drawings and installations begin with no prior diagrams or blueprints and is conceived and developed entirely on site. 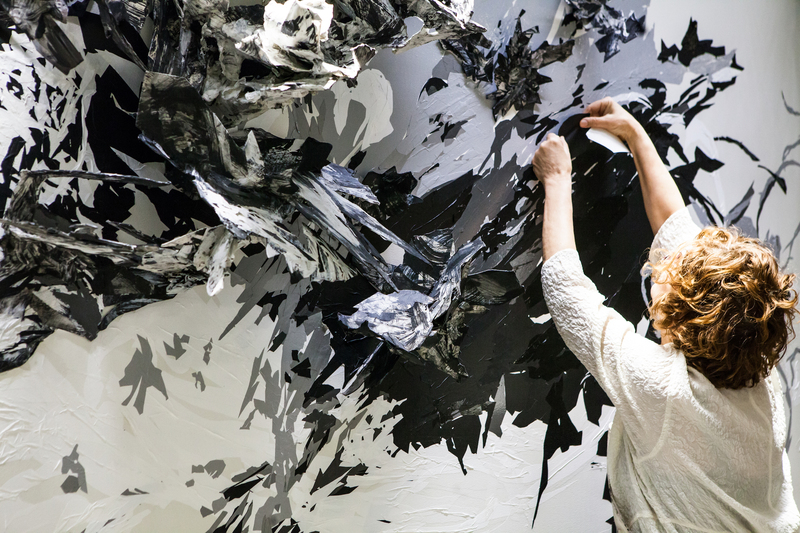 The tape allows for an immediacy and all prior drawing decisions ultimately result in a rich, undulating surface which echoes the frenzy of controlled matter pulling apart. Bio: Debra Weisberg is active nationally and internationally. 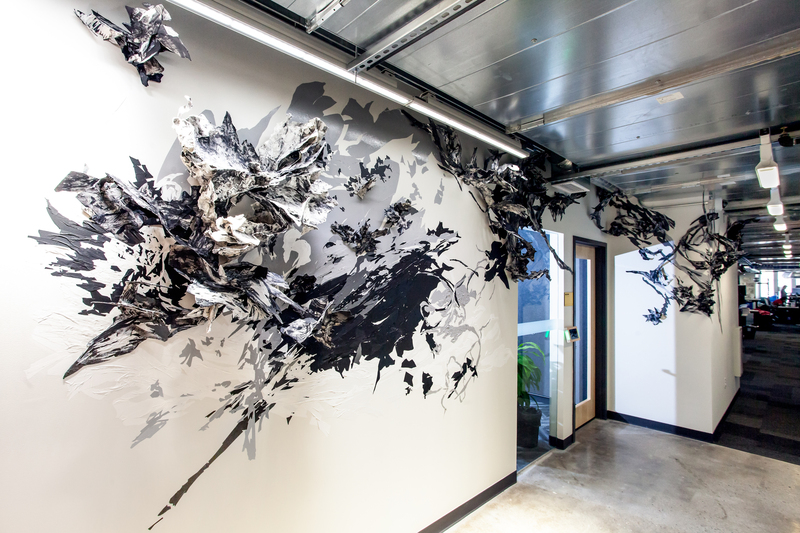 Facebook Boston recently commissioned Weisberg to create an 22-foot long dimensional drawing installation for its corporate office in Cambridge (2017) using hand-cut vinyl signage and paper tapes and sculpted museum board. 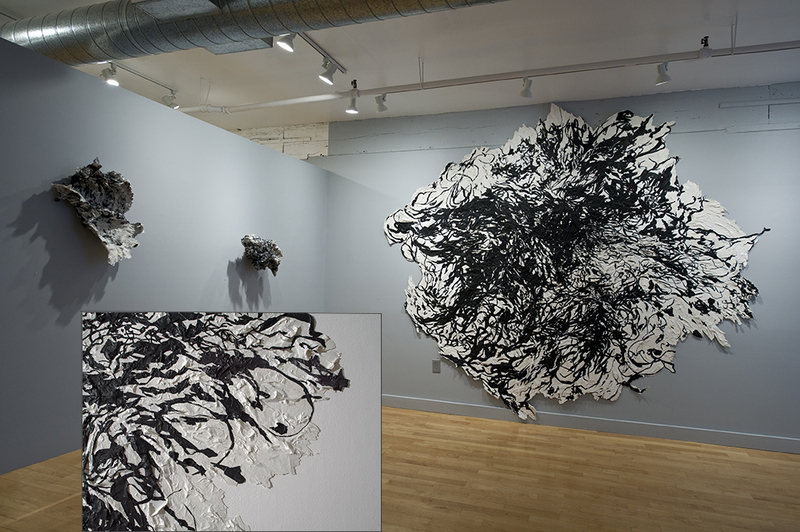 She has exhibited at the Paper Biennial in the Netherlands; Art in General and East Hampton Center for Contemporary Art, New York; and in the Boston area, the Art Complex Museum, Duxbury; Danforth Art Museum; DeCordova Sculpture Park and Museum; Gallery Kayafas; Mills Gallery, Boston Center for the Arts; Rose Art Museum, Brandeis University; Dedee Shattuck Gallery; and VanDernoot Gallery, Lesley University.. Weisberg has twice attended the MacDowell Colony and was awarded an art residency in Can Serrat, outside of Barcelona, for June 2009. In 2008 she was a Massachusetts Cultural Council fellowship winner in drawing. 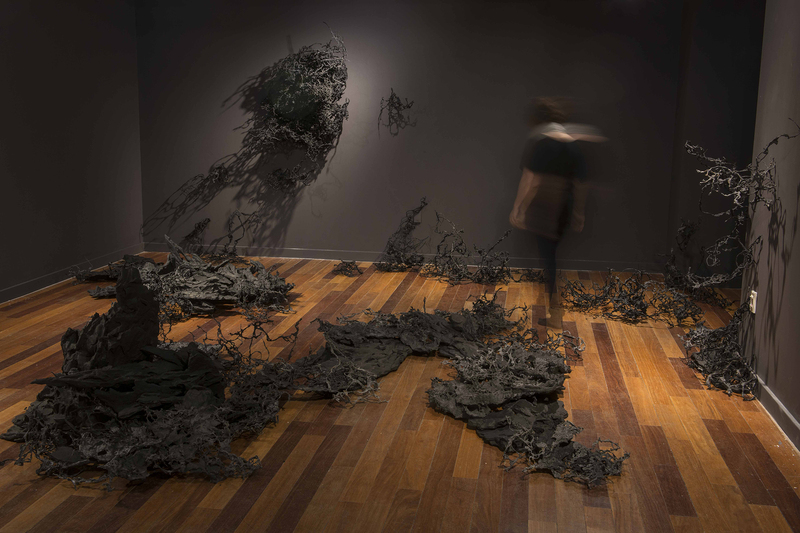 Her forty-foot high installation at the DeCordova entitled (Sub) Surface won an award for best museum installation (2003) from the Boston Art Critics Association. Weisberg was a Somerville Arts Lottery winner in 2001, 2004, 2008, and 2015. Her individual works have entered numerous collections, from the Sonesta Hotel to General Hardware Manufacturing Company in New York. 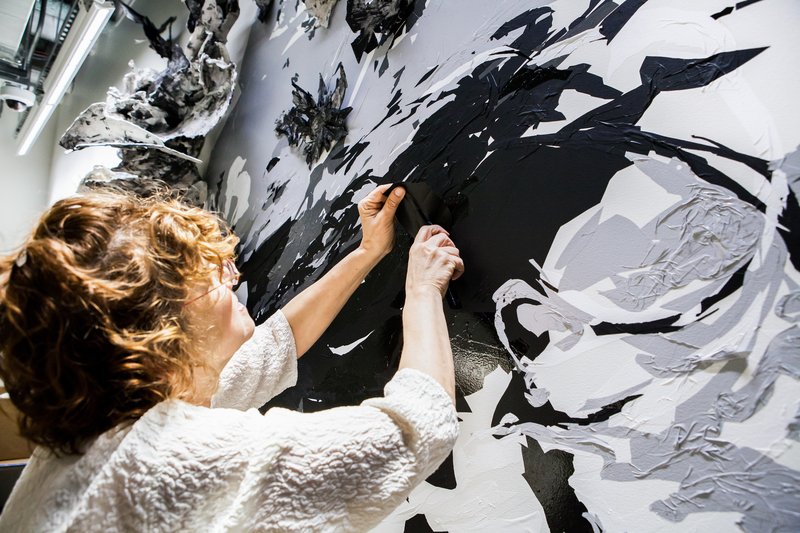 As part of her studio practice the artist collaborates regularly with students on large-scale dimensional drawing installations, the most recent, Somatic (e) SCAPES at Milton Academy (2015).